Here are a couple of new pieces of art from the Gamescom Microsoft trailer. These are 1-to-1 pixel images, just as they appear in the game. Neither of these are completely done, they both need to go though a polish stage. I also wanted to thank Craig Derrick for putting together the deal with Microsoft and generally helping out at Gamescom. Craig worked at LucasArts and was responsible for the Monkey Island Special Editions. He was the executive producer and the driving force behind the re-releases getting made. Many thanks for that and for the help with Thimbleweed. Also enjoy the glory of vertical scrolling rooms. 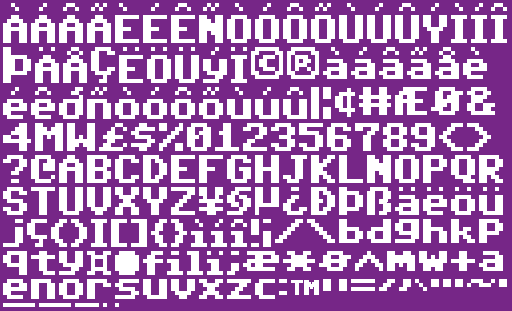 The fine folks at Style64 (Elwix/Style) offered to extend their TrueType C64 font, adding the international characters we'd need for French, German, Italian and Spanish, plus the ™ and a few other symbols. Many thanks to them. It's kind of a short post today, using art and visual images to distract you from the dearth of actual content and information. It's been two weeks since I got back from Germany and I don't feel like I'm completely back in the swing of things. Exterior looks great! will see how its gonna look on full screen. Great job. Any idea why the lower letters are not "in order"? Because they have been packed into a sprite sheet. It's using a best-fit algorithm. Ah! Thanks. I was drawing a blank. If it's using a best fit algorithm, why aren the underscores and periods aligned to the lower right corner, where they would have more room and you could shave a few more pixels from the image? Lovely, lovely, lovely! I think Mark is having a ball here. Great that you are keeping the C64 font. This is really amazing, a great piece of artwork! I can't wait to see how it all comes together. Doesn't matter if it's short, this post made my day. Plus you could add a puzzle on the inside that one needs to solve in order to get to the roof to access the tower. Looking at the weeds in the foreground, made me wonder if you were thinking about adding Thimbleweed into any of the backgrounds. Monkey Island 2 already did vertical scrolling (the cliff on Booty Island). That was horribly faked. It wasn't real vertical scrolling. So it actually was Artificial Vertical Scrolling™? Would you share a tale on how "Artificial Vertical Scrolling™" did the trick? There's a reference on a Twitter post from May with regards to the ship diving sequence in MI2. "That was faked through color cycling and sliding actors for the screen." You mentioned that the diving scene was faked, but there was some vertical scrolling at the cliff where you had to get the map piece, wasn't it? That scrolling is a scene transition effect built into SCUMM, just like dissolve and iris being other effects of that kind. Also Fate of Atlantis uses that effect a lot (in all four directions). It's not possible to freely walk around while the transition effect takes place. Here is the actual SCUMM code that did the cliff panning. It uses a special fade, then it switches to a different room that looks exactly like the bottom of the top of the cliff. Hey, here is the void, you mentioned in the podcast #16, used once again, isn't it? What was the reason you didn't use "real" vertical scrolling? Because of how the SCUMM system did rendering. Everything was compressed into vertical 8px wide strips, this was to speed up horizontal scrolling. We didn't have a lot of CPU in those days, and every trick was needed to get 10fps! It could have been done by flipping the compression, but there were only a couple of rooms that needed it, and it wasn't worth the time. Sounds like moon missions in 60's and 70's. It was quite normal back in the days to work with tiles/stripes. From time to time this is done nowadays, too, but in a quite different way (chipset and graphic controllers of the time featured pixel-wise framebuffer offsetting that could be exploited to achieve very smooth scrolling despite the very low MHz availability). Is the sign at the entrance of the radio station intentionally supposed to be ambiguous as to what it says? I think it says "Weeds and Thimbles". I really like the misty morning atmosphere there. Looks really good, even if it is unpolished. Wonderful! I love how colourful the graphics are. Is the Gamescom trailer anywhere to be seen? Once again, proof that Mark known how to get lighting absolutely right. I like the vertical scrolling! I love Mondays. This is totally beautiful. How Mark Ferrari does that large pixelated gradient color for the sky in the vertical image? The ™-symbol is in a much higher resolution, you cheat! Well spotted! It has a higher resolution indeed. But don't criticize the font too loudly! It looks remarkably similar to the font of the subtitles in Monkey Island (DOS version), albeit it looks a bit complanate in the Quickie Pal video. Commie? It's not a communist computer. It's called Commodore 64. This new font is proportional and that's the way Ron prefer. You're going to need cheesy 80's music for this radio station! Maybe fans could provide some of it? Since Kung Fury I just wait for an excuse to do some power pop rock. I really like where Mark is taking the look and feel of the game, awesome job! Can't wait to peak on more rooms. That's just fantastic piece of pixel art. I'm so glad you decided to go with this style instead of full out "Maniac Mansion". Yay, this implies the C64 font will stay. It is really alternativeless (thats not a real word..except in germany..). Its so iconic. 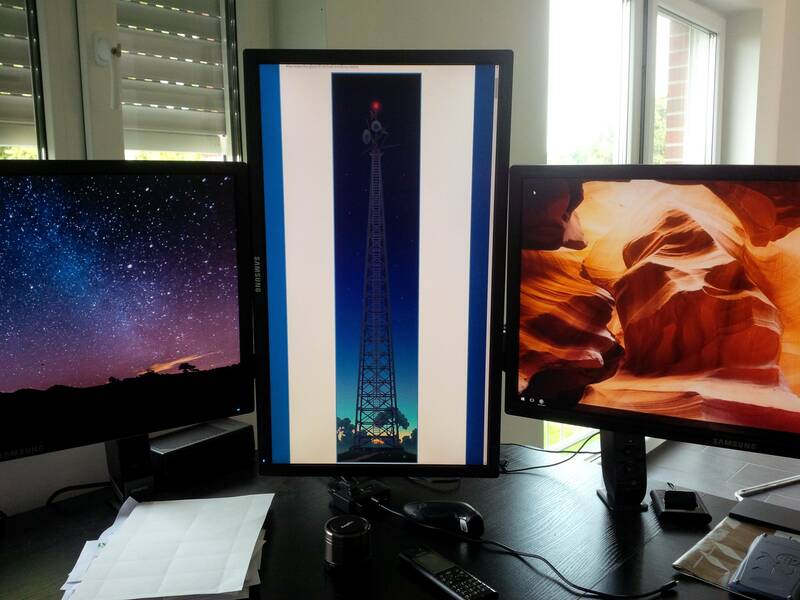 When I scrolled down from the top to bottom on my desktop I just got this "Star Destroyer" feeling of the signal tower. It just kept going and going. Hehe I got some of those same vibes. Ever seen Space Balls? I LOVE THOSE IMAGES ! A BUG KUDOS TO MARK !!! HIS ART IS AMAZING !!! I wonder if those background aren't way too gorgeous. I mean, the initial goal was to capturate the spirit of Maniac Mansion, with the low resolution and big headed characters. Big head character will looks really out of place with such magnificiant backgrounds. We like the big headed characters, they are going to stay. I don't think they look out of place. Mark's art is very clean, which works well with the characters. If the background art was messy (scanned for example, like MI2), then I would agree with you. I really like Monkey 2's scanned art, and I was going to show that the bubbleheads fit those backgrounds too. But they don't. Reminds me how great the art in MI2 is. I think the reason why it doesn't suit is not quite the bobblehead. The characters and backgrounds from TP are very straight, whereas everything is very inclined in that rope bridge cut-scene - more than in other places from Monkey 2. If you had taken e.g. the sewerage or the closeup view of the fisherman on Phatt Island for a comparison with Delores, you probably would have come to a different conclusion. Once the bobbleheads have got more plastic shading, they will go great with the settings in TP. Yeah, the big headed characters worked well with Zak Mckracken VGA and did not look out of place. Current character models just need perhaps a bit more detail/fine tuning. Then again, Zak McKracken didnt have the Bubbleheads but rather proportionally normal ones. I like much the wonderful art of Mark Ferrari, and I like the big headed characters from Gary Winnick too. to be used for normal maps drawing (pixel by pixel) for the characters' sprites (not too much detailed anyway)? Maybe characters would result a bit less flat, and give Mark/Gary an additional tool to build mood. I love the current art direction, anyway. "We shall go on to the end, we shall fight for the big headed characters, we shall fight for the bobbleheads, we shall fight with growing confidence and growing strength on the blog, we shall defend our big headed characters, whatever the cost may be; we shall never surrender." "Using art and visual images to distract you from the dearth of actual content and information". What does KSCUM stand for? In the US, Radio Stations on the East coast have four-letter codes starting with W (e.g., the classic rock station Q104.3 here in NYC has the 4-letter code WXRQ). Stations on the West coast start with the letter K (e.g. K-Rock, a rock radio station in LA, had the code KROQ), so KSCUM is a reference to the fact that the radio station is in the western half of the US *and* a simultaneous reference to the SCUMM Engine Ron Gilbert used to make Maniac Mansion which was also used in the rest of the LucasArts adventure games up until Grim Fandango. The SCUMM was my guess for the SCUM, but the K... I had no idea, thanks! BTW, I made a mistake. The four-letter code for Q104.3 here in NYC is WAXQ, not WXRQ. Iron Curtain regrets the error. @RON: It's good to have Craig as business relationship. If TP hits the market like a bomb, it would be great to have a Special Edition later on with updated GFX and Stuff. i played both MI SEs few months ago and liked the new design very well. The implementation and option to play the "PIXEL Retro" was a great idea. Of course the MI Special Editions are nice, but if Ron actually wanted to make a re-release of TP one day, he wouldn't have any reason to firstly make TP with such a low resolution, I think. Thimbleweed Park is rather meant to be a reminiscence of low resolutions and the very special charm of classic adventure games. So a TP Special Edition would miss the point. I think it was a podcast where Ron said he played the MI SE version, but preferred to play in retro mode. So I'm pretty sure there won't be a hires-TP. And. I've played both SE versions, and I always felt they were missing something. Maybe it's just the memory of those great moments with these games when I was young, but the SE versions, while they look gorgeous, just don't feel that good. And neither did Monkey 3, but then again, there was different team working on it. That's true. When I was playing these later games I always missed the verbs and the inventory at the bottom of the screen. Not least because of their great ergonomics, even though they need space on the screen. And I also love the low resolution, as every pixel is chosen with a high degree of consideration. It's like enjoying an impressionistic painting. By the way, I think that 3D is not very appropriate, if you want to create highly detailed settings. That's why I would always prefer 2D graphics in an adventure game. Well, I think the characters' art is not finished, so they can still look better. I'm really pleased with the art direction and I'm even more hopeful now that Mark Ferrari is involved. Are the heights of the characters in the sprite sheet above correct? I just recognized that e. g. the ä, ё, ö, ü of the new font have a total height of 7 pixels, but the i has a height of only 6 pixels - incl. its dot. This doesn't seem very concerted. Furthermore in my opinion the font would look a bit better if the characters h, l, t, b, d, f, k, i were as high as the majuscules (7 px instead of 6 px). Well, I just compared the font with the one from Monkey 1 and recognized the same characteristics, unless the h, l, t, b, d, f, k are one pixel taller as I recommended above. Maybe I'm a little bit petty. I'm not sure what Monkey Island, which uses a custom font, has to do with any of this. I suggest you check the default font on the C64 instead---you'll find it's a match. I wasn't very familiar with the C64. I was simply wondering why some minuscles were not as high as the majuscles. It even would have been a little bit more readable if the heights were consistent. However you're right. It's definitely the C64 font, as I noticed later on. Nevertheless I reserved the right to compare it with the MI font, which I'm very familiar with, and I found out that they also have a great deal in common, except of the inconsistency of the heights. If I had to guess what is going on, the C64 screen was divided into cells of 8x8 pixels. If the letter "i" had been as tall as "a," then its dot would have been on the cell's top row, potentially touching letters using the bottom pixel row on the line above (e.g., the bottom of "j"). You'll notice that this font has some taller letters, given that we don't have the same limitations. However, they kept the legacy "i" and made its cousins (e.g., "ï") consistent with it. I didn't think of the height difference earlier, but now I see what you mean. I recommend that you contact the polite creator(s) and ask your questions: http://style64.org/c64-truetype They appreciate feedback! Though I presume that Ron likes it the way it is, as he prefers a C64-like font. It's a matter of opinion. I generally have a deep respect for his decisions, so I think I won't tamper with this subject. But keep on rocking, im sure you'll gonna do great! Hi Ron, I really would like you ro write more about puzzles. How do you work them? when do you know that you have enough? how much you do one first or the other, etc. I´m really perplexed by how detailed people seem to remember things such as (faked...) vertical scrolling on old games such as MI 2 ?! The only thing about that game which I do (and always will - in fact it will likely be part of the short-film flashing before my eyes in the moment I pass away...;) ) is the part where you needed to get the last ingredient of Le Chuck for the Voodoo stuff. Oh the good old times. Ron, you mentioned the MI special editions... Did you have any personal involvement in porting those over to Xbox 360? And if so, will any of that experience help when you create the Thimbleweed Park port for Xbox One? No, I had no involvement in those. I was long gone by then. I think every pixel in this tower represents our expectations for Thimbleweed Park gameplay! :-).